Tumbled Zebra Agate healing gemstones. These are what I would consider to be a medium to larger size of 1" and larger. Zebra Agate provides understanding and compassion for others. Great in balancing personal auras. Brings spiritual energy into the hara line and roots it into reality and consciousness. Clears energy blockages, balances Earth and Sky, grounds while elevating awareness. Assists in clearing emotional pain and aids in centering and focus. Zebra Agate has a Trigonal crystal system and is in the mineral class of oxides, the quartz group. I should mention that some may know this one as Crazy Lace. It is a unique combination of Quartz and Basalt (volcanic rock). Hot silicic acid solutions accumulate in hollow spaces from gas bubbles in cooling lava. As they cool, they solidify into quartz, layer by layer, in these hollow spaces. Its coloring is always black and white, and generally in a noticeable striped "Zebra" pattern. Occasionally small amounts of iron have been encompased by the quartz and they may show fine red to brown colored lines between the Quartz and Basalt unions, but more often it is just Quartz and Basalt. Zebra Agate, like many Agates is best used in contact with the skin and can be worn for long periods of time. To experience the greatest spiritual benefits I have found meditating with several to be quite rewarding. Zebra Agate brings understanding and compassion for others. It provides a contemplative attitude that allows us to recognize the deeper aspects of the loving spirit of those around us and to overlook the outer, more superficial aspects they may show. It is also a great aid in balancing personal auras. When this has been done, one will realize a protective effect which harmonizes and stabilizes our health on all levels. 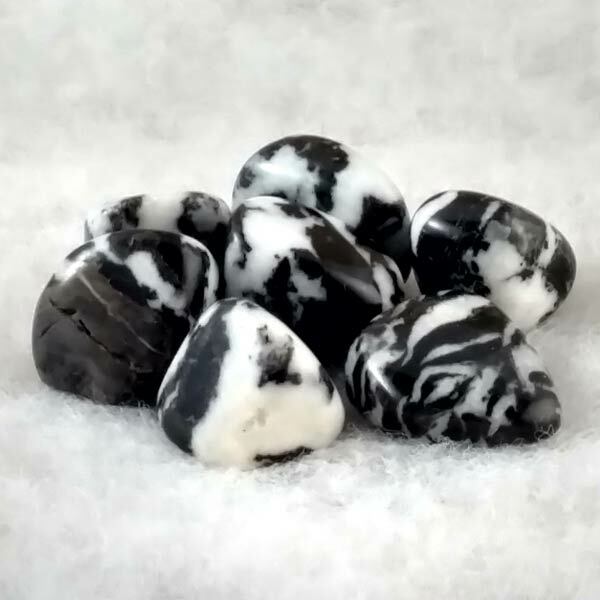 Zebra Agate provides a secure and safe inner base that aids us in resisting external influences. In helping to bring about inner balance, this gem carries a most distinct effect in that it is a great aid in reducing inner tension. Zebra Agate, like many agates, is excellent for bringing about logical thought. We become aware of simple solutions that can be put into action in a quick, but calm manner. Zebra Agate has been shown to stimulate physical energy in a way that is quite beneficial for athletes in that it provides stamina and endurance to its user. It has also been used in the treatment of bone loss and to slow degeneration of the teeth and gums. 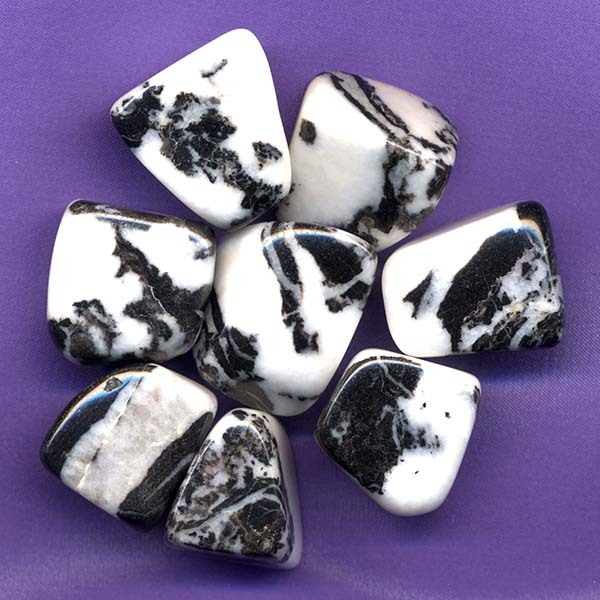 Zebra Agate has a special affinity with Gemini and Taurus. It has a Receptive Energy, its Planet is generally associated with Mercury (as most agates are) and its Element is Earth. It is a good aid to guard against physical dangers. The most common use of Zebra Agate in the past was to make protective amulets for children. This use seems to have been common through many ancient peoples and was probably the most predominant in Asian cultures where protective serpents were carved onto their surfaces. Today, many use this gem to celebrate Spring and Autumn equinoxes. Because of its half black and half white coloring it is beneficial in celebrating the balance of night and day and invokes a deep felt spiritual balance.